Home » Bathroom Help Category -- Also note those subcategories in the orange navigation, above! 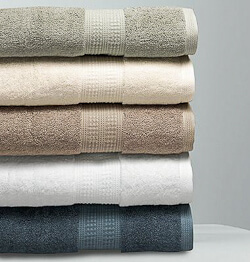 » Accessories, hardware » Best bath towels for the money? Best bath towels for the money? BUT, UPDATE Oct. 23 — The family now has washed the towels and bad news, some of the towels did not hold their color. They got that blotchy rusty look in spots. Dear Husband went online and found complaints. Although, there also seems to be info that these spots are caused by face care products. For this reason — and for other key reasons — recommendation: WITHDRAWN. Read through all the comments and maybe like me, you will come to the conclusion that the best value in bath towels is to buy them VINTAGE. That’s right. The bath towels made in th 50s, 60s, 70s — maybe even into the 80s — seem to have been much better made. They last forever. They may be “thinner” than the plush towels today — but *plushy comfort* aside, they seem to be more absorbent. They don’t pill… again, they seem to last on and on. Where to find them: Search etsy.com — where I usually can find a good selection, including New Old Stock. Check ebay, too. These sellers probably found these towels at estate sales and thrift shops like Goodwill or the Salvation Army. Also check with family — parents, grandparents, aunts and uncles — they might have extras (including New Old Stock they never opened) that they would be happy to give you, once you admired them. As newlyweds, DH and I bought two sets (bath towel, hand towel, washcloth) of Cannon Royal Family. Some were lost, but 21 years later the two items we still have are the softest towels we own! and the color is still perfect (they always get chlorine bleach, too). The stitching popped along the edges after several years, but a needle and thread fixed that in about three minutes. The towels are small compared to what you find today, but still very absorbent, and if I’d known they were an endangered species, I’d have bought another piece every month until my linen closet was full! Even after four children, these are still my favorite towels. We have extensive research on bathroom products, features, design ideas and reader remodels to help you!